he Travel Pod Action AIR has a large living area and an optional two berth inner tent can be fitted. 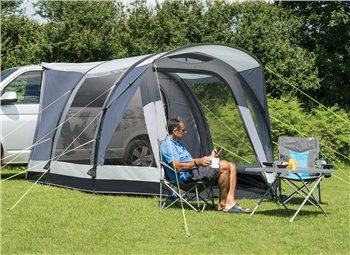 The awning comes complete with a fully waterproof clip-in groundsheet which can be removed on sites that do not allow the use of groundsheets. A large protective canopy covers the front door - ideal for poor weather conditions. We had it delivered to France and it came 5 days after ordering it. It's quite light to pick up in its bag. After a quick glance at the instructions it simply flew up, (without the 2 falls, one submission and near divorce the original awning gave us) it also fitted perfectly to our trailer tent. We've yet to use it in anger but with our first impressions it's brilliant. To summarize the service and delivery from camping world was faultless, also the product was competitively priced also it's a cracking bit of kit.